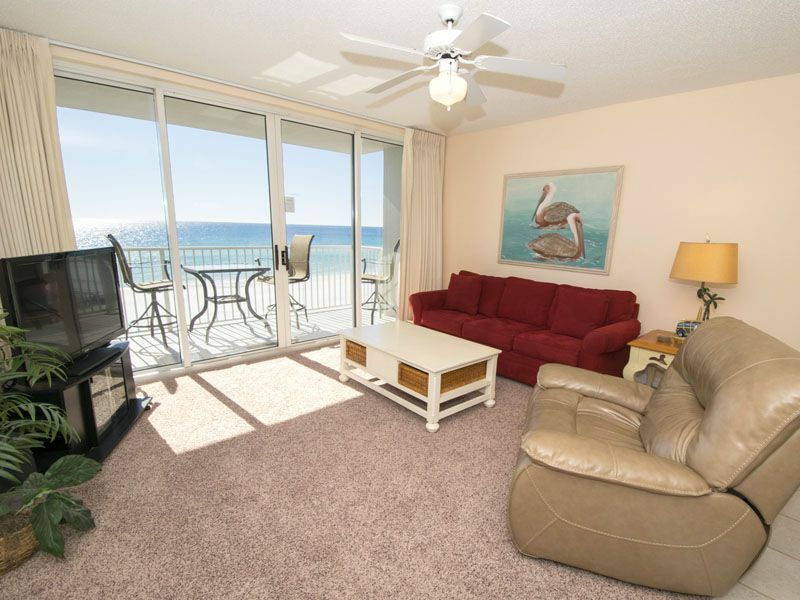 Escape to the beautiful beaches of the Emerald Coast and stay at Island Princess #515 in Fort Walton Beach, Florida. This is a fantastic property with a beach side pool, incredible Gulf views and exciting resort amenities. Stay directly on the beach and see what all Okaloosa Island has to offer. This three bedroom, three full baths, condo sleeps up to eight people, making it the ideal choice for a family vacation or a group getaway. Spend your days relaxing on the beach or lounging around the waterfront community pool and hot tub. Great trip, condo was exactly like the pics on line. There were a few minor things, but overall we were very satisfied. Fun family get away. We are glad you had a great stay and appreciate your positive feedback. Please visit again soon! The room was dirty and there was no table on the balcony as shown. Second bedroom curtains FILTHY. We are so sorry that Hurricane Michael interrupted your stay and kept you from truly enjoying your vacation. We're passed your feedback on and hope you'll return this spring to enjoy this newly renovated condo! First off, let me say that this condo does offer a beautiful view of the ocean. Unfortunately that’s about the only positive. Kitchen cabinets had cracks throughout and were “repaired” with tape. All bathrooms had molded tile and looked dirty. Two of three bathrooms had drains that were so clogged, we had to plunge them. Carpet throughout condo was sticky and disgusting and I found goldfish crackers embedded in the carpet in one of the bedrooms. Bed linens and comforters were dirty and worn. No table on outdoor patio, despite appearing in pictures. Half the outlets didn’t work and breakers blew on multiple occasions for no apparent reason. I got a text message one day from the owners asking if they could show the condo one morning between 8am-9am since it is up for sale. Very unprofessional in my opinion to ask a guest if you can interrupt their vacation to try to sell a condo. When you spend this kind of money to rent a condo, you expect it to be much nicer and well taken care of. It was very disappointing and we will not be back. Thank you for this feedback Nick. We are happy to hear that you enjoyed your view from the condo. We are pleased to report that this property is undergoing renovations this off season and will debuted in Spring 2019. We apologize about the inconvenience you felt due to the property being for sale. It is our role to be accommodated to both the owners selling the property and the guests and that is why we always clear it with the guests before scheduling a showing. We hope you will return this spring and see what improvements have been made! The property could use some updating especially in the bathrooms and kitchen. It could also have been cleaned better than it was. The bathtubs were dirty and the floors throughout the condo were dirty. Had to do some cleaning when we first arrived. Also, had to change a lot of the lightbulbs that were burnt out. Had a hard time getting the dryer to work on a continuous basis. It seems that if it got hot it had to cool down before you could start it again. We also found some Palmetto cockroaches in the room. There was not a table on the balcony only chairs so we could not take advantage of eating out on the balcony. We did have a great time on the beach and were able to access the beach chairs and umbrella each day. Thank you for taking the time to review your vacation Shawn. We are terribly sorry to hear that it fell below our Southern standard and your expectations. We would have been happy to address your cleanliness and maintenance concerns had we been made aware. We have looked into the issues with the dryer and are happy to report it is working perfectly. If you are ever on the Gulf Coast again we would love to have you a show you a stay that meets the true Southern standard. 3.HAD TO PLUNGE BATHTUB MYSELF WHEN WATER WOULDN'T GO DOWN-PULLED OUT GOBS OF HAIR. 4.SOMEONE ALWAYS IN "515" PARKING SPOT. Thank you for this feedback! We are always looking for opportunities to improve. We apologize about the balcony table being missing. It was in need of replacement and we will get the photos updated as soon as possible. We also apologize about the clogged drain and would have been happy to come address that for you. We've passed the issues with the elevator and parking to the HOA. During peak times the elevators can run a little slow due to heavy usage but they are checking for possible additional issues. All in all we are happy to hear that you enjoyed your stay and hope to see you back again! The condo was clean, well equipped and had everything we needed. Pool area was well taken care of and the beach was just steps away. The view was beautiful! The only slight inconvenience was the Elevators were being worked on and one was out of order for the week leaving the remaining elevators very busy but other than that, the place was great! Would definitely come back!! Thank you so much for providing us with a review. We truly appreciate you taking the time to do so. And we are so glad that your stay with Southern Rentals & Real Estate was enjoyable. Please come back and visit again soon. We would love to have you as a guest.